Though not the greatest, the Sinclair hard-keyboard was fine by the form-before-function standards of 1980s 8-bit trash computers. And now you can have something very similar indeed on your cherry-stem mechanical keyboard! 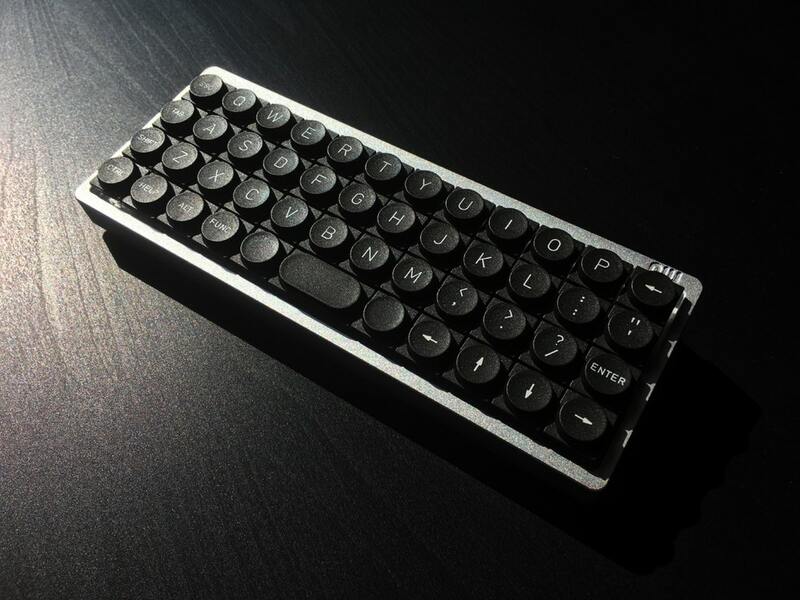 Achieve a true vintage look on your ortholinear keyboard with the Teletype Z-Series double-shot keyset, featuring a classic white on black colour scheme. Z-Series is unlike any other previously available keycap profile, flat and non-sculpted featuring a circular surface and a square base. This profile provides a truly retro computing feel while maintaining a comfortable typing experience. These keycaps are produced by Devlin in the UK. This keyset is for the Planck keyboard and therefore only contains 1u and 2u keycaps. See the keyset diagram image for all include keys. Please note: This keyset does not feature homing bumps or bars on the F and J keys. As the copy says, the set fits only the Planck keyboard and other very similar models; perhaps a more complete set will be available later. The photo, revealing its lovely texture, is by iamjaklol from the Mechanical Keyboards subreddit.